Two "Sungrazing" comets are seen heading in tandem towards the Suns corona. They do not reappear on the other side. The comets follow similar but not identical orbits and enter the tenuous outer atmosphere of the Sun. 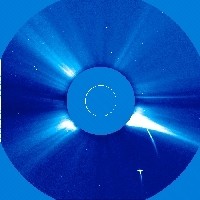 Shortly after the comets disappeared behind the occulting disks of the coronagraph, a bright helical-shape prominence erupts from the Sun as part of a CME. The planet Mars can be seen in the upper right corner while the bright star Aldebaran can be seen in the lower right part. Comets, composed of ice and dust, characteristically have particles streaming out behind them. Comets can be found zooming around space quite frequently.